Within the framework of an entire facilities project, success is often measured by the client in terms of budget, schedule, and quality--both functional and aesthetic. It is often said that owners can have it 揊ast, Good, or Cheap,� and they can only pick two. However, facilities projects exist within a larger institutional context and the trade-offs that frequently occur among these success measures can have implications well beyond the project. The facilities project is not the end. Rather, it is a means to an end that serves an institution抯 larger strategic plan. This often-distant strategic purpose can easily be lost in the immediacy of a project抯 揊ast-Good-Cheap� design and construction decision-making. The remedy lies in the development of a program grounded in the strategic plans of the institution �u> a Strategic Program. Such a program helps to ensure that facilities projects remain aligned with their strategic purpose throughout the course of the rough and tumble facilities process. Here I will discuss the fundamental differences between traditional programming and strategic programming. In addition, I will share a scenario demonstrating the benefits and impacts of a strategic programming approach. Clear and effective communication of information throughout the process is critical to the success of a facilities project. The project architect plays a pivotal role in the communications process. The architect relies on two key sets of documents to ensure that the client抯 intent is successfully reflected in the built space. Working directly with the client, the architect is responsible for ensuring that the client抯 needs are captured and documented in a Program. And, with the program as its foundation, the architect works with an integrated project team to translate the program into Design and Construction Documents and, ultimately, into new Facilities. Together with the client, the architect must ensure that information flows between these documents. This simplified project process is illustrated below. This traditional view of programming and design in the project process comes up short in two key areas. First, at best it presumes, but rarely includes, the upstream roles of institutional strategic plans and any associated operational and service plans in the program document. Within the project environment, the program is the beginning. Those aspects of the institution that define the program are largely unknown to the project team. And, second, the traditional view of programming does not readily capture the implications of downstream design and construction decisions. The program becomes a variable to be used to solve for the success of the facilities project. As a result, post occupancy evaluations, if they happen at all, tend to focus on measures of user satisfaction, quality, and functional efficiency while ignoring assessments of the project抯 success in meeting its initial strategic purpose. The concept and practice of Strategic Programming addresses these deficiencies in the classic model in two ways: Strategic Integration and Dynamic Programming. Through Strategic Integration, the collaborative development of the program includes an explicit recognition of its relationship to the client抯 strategic plans. 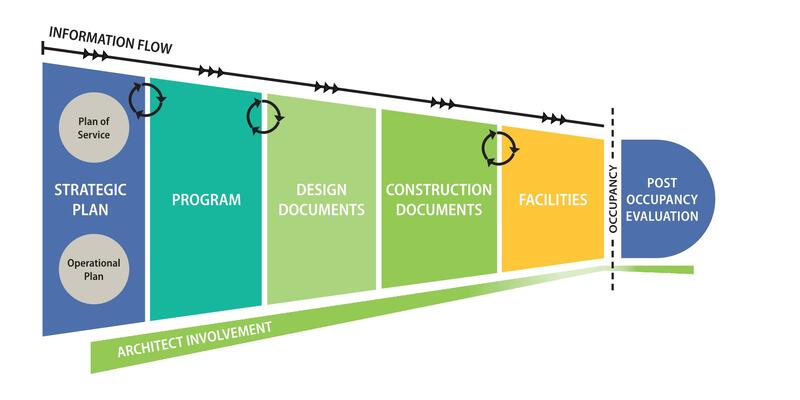 In some cases, this may be as simple as the recognition of the specific facilities project as a goal-based initiative within the strategic plan. However, in our rapidly changing healthcare environment, it is increasingly the case that facilities projects are intended to support new service and care delivery models. In these cases, the program is not a simple tabulation of spaces drawing on industry standard metrics. Rather, the strategic program is an expression of the space types and amounts associated with the new service models and operational plans that are anticipated in the strategic plan. These strategic implications can range from minor adaptations of current practices to wholly new care models. In either case, to ensure alignment, the program must clearly describe its relationships to these models -- and through them -- to the strategic plan. The collaboration between the client and the architect that produces the program should be extended to include its strategic integration. A key component is the development of a program modeling tool that enables the client to quickly visualize and evaluate the impacts on the facilities program of their assumptions about the planned service model抯 operational metrics. Constructed as a model, rather than a standard program table, this tool integrates the articulation of a service model with its facilities requirements and supports rapid, iterative planning and programming. The resultant strategic program is aligned with the client抯 strategic objectives and fully informed with respect to its alternatives. As shown below, with Strategic Integration, the classic project process is expanded to include its strategic objectives as essential inputs to the Program. While Strategic Integration enhances the alignment and quality of the program, and ultimately the quality of the project, in the traditional model, once the program is set, information still flows in the same linear sequence from program through design. With Dynamic Programming, the client and project team can ensure that downstream design and scope decisions are informed by their strategic implications, as well as their facilities project impacts. During the design and construction process, changes can arise from any number of sources, including budget/cost considerations, user requests, site conditions, code/permit requirements and constructability concerns. With the availability of a dynamic, model-based, programming tool, the impacts on plans and programs of these downstream decisions can be readily evaluated by 憆eversing� the flow of the model and solving for the plans and program that respond to the project抯 constraints. As shown below, Dynamic Programming is incorporated into the traditional process by carrying the program into the design process and testing design options against the program in real time. 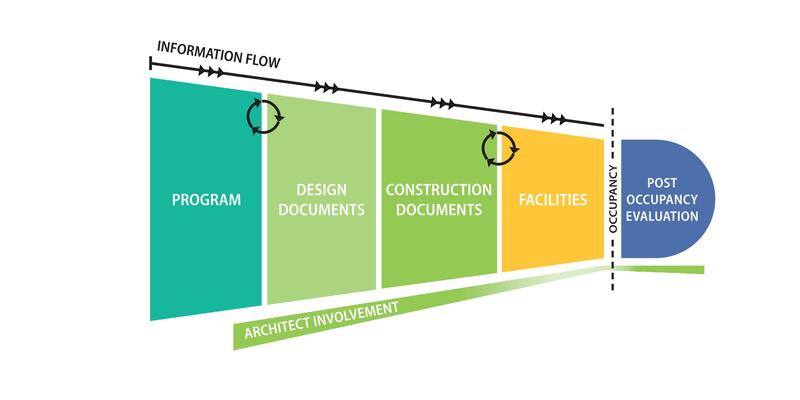 While still following a linear flow, this enhanced process now incorporates specific feedback mechanisms and tools to ensure its alignment between plans and program, between program and design, and between design and construction. To envision Strategic Programming in action, consider the hypothetical case of a healthcare system with a strategic commitment to Lean practices and a strategic objective of developing a Lean-designed ambulatory care center. Working with an architect with expertise in strategic planning and Lean healthcare design, a programming model is developed that includes the relationships between key Lean metrics of Takt times, staffing, patient volumes, patient waiting, Lean service models, and exam room utilization. Through iterative assumptions on these key variables, a space program is developed and tested through a conceptual design and cost model. With confidence that there could be a feasible and affordable ambulatory care center project that aligned with its strategic objectives, a 150,000 gross square foot (gsf) project is given a green light and a budget to proceed. Reducing exam room sizes from the planned 135 square foot (sf) universal room to a 110 sf standard room. This change is estimated to reduce the program by 4,500 gsf with a savings of $2.3 million. Eliminating the 搊n-stage/off-stage� corridor scheme is estimated to reduce the program by 11,000 gsf and $5.5 million. The option to reduce exam room sizes from universal rooms to standard exam rooms is rejected based on its financial and service model impacts, while the option to eliminate the 搊n-stage/off-stage� corridor is accepted, albeit reluctantly. The project is then able to quickly move forward with a revised program that is affordable and aligned with the client抯 strategic objectives. 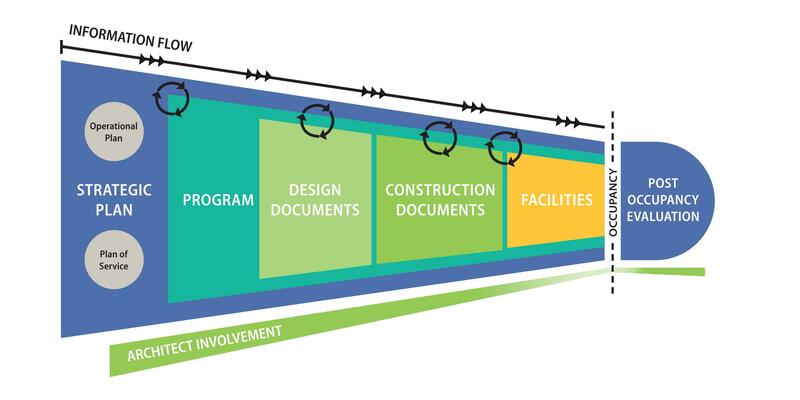 While this example is hypothetical, it draws on actual experiences employing a Strategic Programming approach to the master planning and conceptual design of a major ambulatory center for a local health system. Strategic Integration, in the form of facilitated vision development and service and operational model workshops, was critical to the development of a Program that reflected the health system抯 plans for a new model of care. Dynamic Programming enabled the health system to better understand the space and cost implications of various expressions of its service model and select one that they are comfortable will meet their budget and service goals. The key to the success of this effort was the collaborative engagement between the client team and the architect抯 planning services team, well before the program was set.